Criminal investigations may benefit from new forensic methods based on nanoparticles. 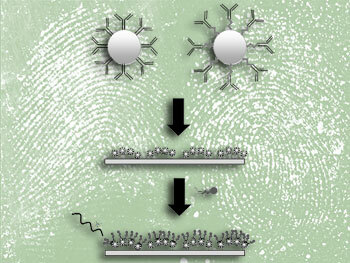 A technique using gold nanoparticles in combination with antibodies has shown promising results for enhancing fingerprints that are over a week old. Fingerprinting, first reported in the 19th century, is still the primary source of evidence used in crime scene investigation and new methods for improving fingerprint visualisation remain in demand. Unseen (latent) fingerprints can be revealed using chemical treatments that target molecules likely to be deposited in fingerprints, such as those in hair follicle secretions. Xanthe Spindler at the University of Technology Sydney in Australia and colleagues now report a technique that targets amino acids - present ubiquitously in sweat and thus in most fingerprints.1 They linked amino acid-binding antibodies to gold nanoparticles and applied them to fingerprints. To develop and image the prints, they used red fluorescent secondary antibodies that would stick to the nanoparticle-bound antibodies. 'The idea was that on rigid structures like nanoparticles the antibodies would distribute better,' says Spindler. 'They'd give us sharp detail and we'd get lots of antibodies across the surface of the fingerprint, which then when we put the dye on would mean a much higher dye response.' Although it's not clear exactly how the nanoparticles work, Spindler says it may be down to their larger surface area. The team's method builds on research by scientists at the University of East Anglia in the UK to develop fingerprints from drugs excreted in sweat. 'They've taken the idea that we proposed - using a nanoparticle and coating it with antibodies - and they've made it available to detect all fingerprints, which is a nice extension of the work,' says David Russell, a member of the UK team.